“The nation of Israel is the vineyard of the Lord of Heaven’s Armies. The people of Judah are his pleasant garden. He expected a crop of justice, but instead he found oppression. He expected to find righteousness, but instead he heard cries of violence” (Isaiah 5:7, NLT). In the gospels of Matthew, Mark, and Luke, Jesus told a parable about a landowner who planted a vineyard (Matthew 21:33-46; Mark 12:1-12; Luke 20:9-19). In the minds of its hearers this parable was a familiar Old Testament theme that alluded to Isaiah’s song of the vineyard in Isaiah 5 (see also Psalms 80:6-16). In Isaiah’s song of the vineyard, the nation of Israel is described as the vineyard of the Lord. Then God pronounces woes and judgments on Israel because of its wickedness and hypocrisy: “What sorrow for those who say that evil is good and good is evil, that dark is light and light is dark, that bitter is sweet and sweet is bitter. What sorrow for those who are wise in their own eyes and think themselves so clever” (Isaiah 5:20-21). In the Parable of the Tenants, Jesus clearly associated His parable with Isaiah’s song of the vineyard by summarizing Isaiah’s description of the features of the vineyard: a wall around it, a wine press in it, and a watchtower. 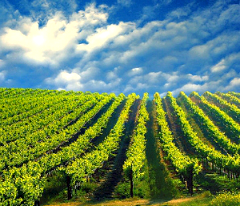 The landowner rents the vineyard to some farmers and goes away on a journey. Again, this was a familiar concept to the hearers of this parable. In Isaiah’s time land in Israel could only be leased and not sold because parcels of land had been permanently assigned to individual families and handed down from generation to generation. When the harvest came, the landowner sent his servants to the tenant-farmers to collect his royalty on the fruit that was harvested from the vineyard. The tenants repeatedly beat and killed the servants that the landowner sent to them to collect his share of the harvest. Finally, the landowner sent his son to collect from the tenants thinking that they would respect his son. Unfortunately, the tenants thought differently and killed the son reasoning that since he was the heir, they could then take his inheritance. Jesus ends the Parable of the Tenants with a question to His listeners: What will the landowner do to those tenants? The listeners answer that the landowner should lease the vineyard to other tenants who will pay him his fair share of the crop at the harvest. Jesus agrees with them concluding that in the same way as the landowner should cancel the lease of the tenant-farmers, so also the kingdom of God will be taken from the Jews and given to a people who will produce its fruit. People are the keepers of God’s Kingdom here on earth, and like a vineyard, the Kingdom requires responsible and productive persons to work in it to make it grow. God is a good businessman and when His workers are no longer productive, then their services are no longer needed and God finds other workers who want to be productive. If God’s vineyard is to grow, then it’s workers must be productive. It’s just good business! This entry was posted in Kingdom of God, productivity and tagged Bible, Kingdom of God, productivity. Bookmark the permalink.